Liquilights Glow Gloss sparkles brilliantly during the day and illuminates under UV black light after dark. Enriched with natural oils and vitamin E to keep your lips soft and hydrated all day and night. Gloss can be worn alone for a pop of sparkle and colour, or paired with One Direction creme lipstick for a bolder look. I really need to get myself a UV light to test out the Liquilights Glow Gloss in the dark. Nonetheless, the lip glosses are shimmery and very pigmented. Through the Dark provides a pink-red gloss. While Taken is more towards a bubblegum pink. 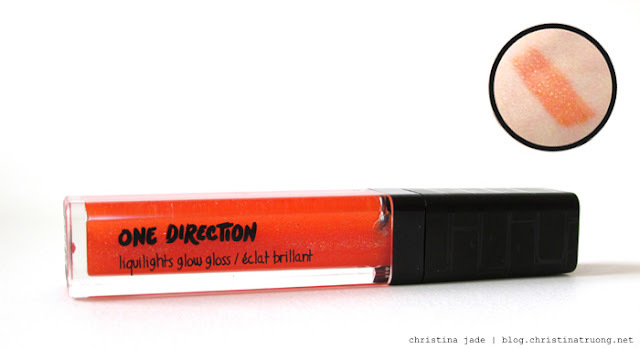 And Kiss You is an orange gloss, similar to the aftermath of drinking orange soda and your lips turning orange. Unlike some lip glosses, the Liquilights Glow Gloss is not sticky. And the scent is very pleasant, with a hint of sweet vanilla. Rock Me Nail Kit, featuring Neon UV-Reactive Nail Varnish and UV-Reactive Glitter nail toppings that add even more sizzle to your manicure, for nails that light up day and night. Sprinkle the glitter over wet polish for a subtle accent, or go for the glitz and dip your entire wet mani in a mega-watt sparkle! As mentioned earlier, I need to get a UV light! I really want to see these nails glow! Because who doesn't want glowing nails in the dark? 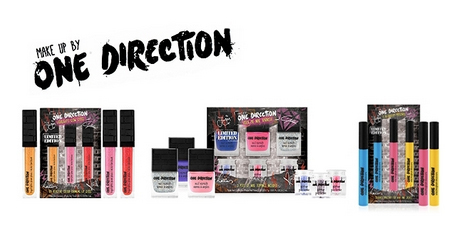 The Rock Me Nail kit is absolutely amazing! A nail polish lover like me, I was really excited to add a few more colours in my collection. And with the glitter toppings, there are countless combinations to jazz up those nails. Have your entire nail filled with glitter (shown below), just a sprinkle for a sparkle or my favourite way, just on the tip for an updated french manicure! No matter how to want your glitter to appear on your nails, remember to lay out a sheet of paper before starting so the glitter does not create a sparkling mess. Also, lightly dust or tap your nails for excess glitter and add a top coat when nails are dried. Happily is not what it seems on the bottle. I expected a dark blue but when I started painting, the colour was sheer and the nail polish consistency was very watery. Maybe I had a bad bottle? It was still a great shade - just wasn't what I thought. Moments is a true "neon pink", the consistency was just like any other nail polish and not watery, glide on with the colour nicely. Even after one coat, it gave great colour payoff. 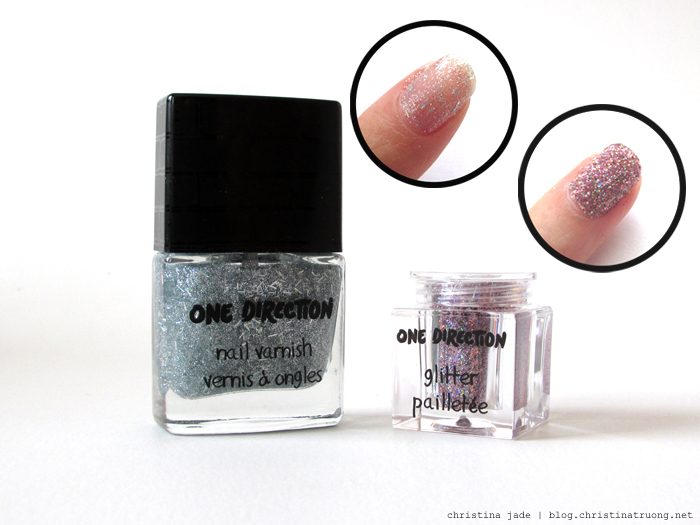 Diana is a clear nail polish with sparkles and glitter. Judging from the bottle, I thought it would be a full coverage glitter polish. I had to add a few coats to get some glitter on the nail, otherwise, with only the first coat, it will only provide a clear polish with little to no glitter. For Lashes - Make a subtle statement by adding a pop of colour to the tips of your lashes, or add coats to your entire lashes for a shockingly chic look. The more the better! Hair Mascara - Apply to small sections of hair and swipe through for instant Electric highlights. **Apologies: Due to logistical issues, review and swatches for Electro Glam Mascara are unavailable. Overall, wonderful sets for those who are interested in a specific product or want to add to their collection of lip glosses, nail polish, or mascaras. 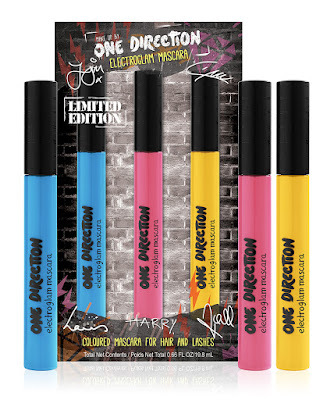 A perfect gift for those who are makeup beginners, enthusiasts, and especially the ones who love One Direction! I purchased a few kits for the holidays for the little ones and I can't wait for them to use them during play days and sleepovers. What do you think of these kits? Will you be purchasing them? 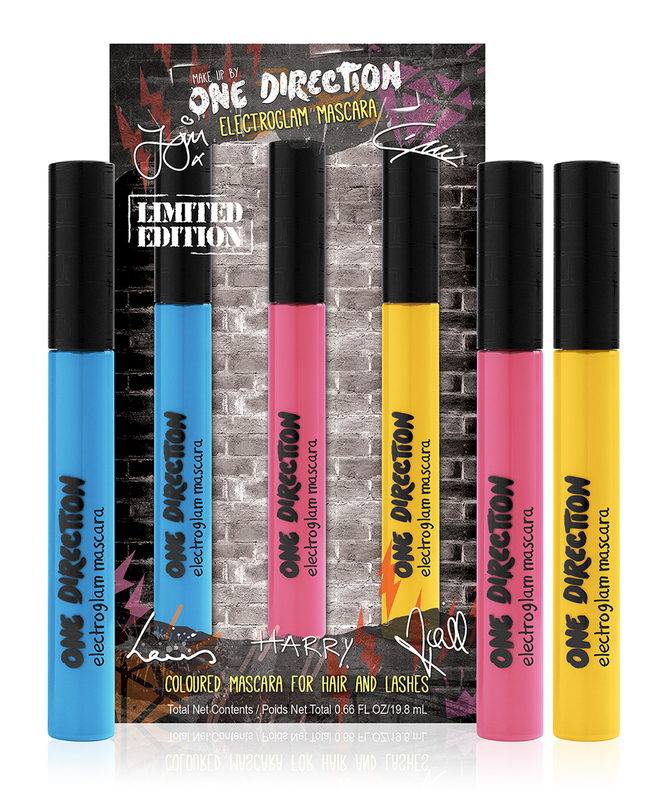 If so, act fast, these Limited Edition Makeup by One Direction kits are in stores now! Available at Macy's, Dillards, Boscov's, Stage Stores, Beauty Brands, and Lord & Taylor. And don't forget to "Like" Makeup by One Direction on Facebook for more tips, tricks and be the first to know about future collections.